I live in zone 7b so I am able to start vegetable gardening fairly early. I did not get a crop of brussels sprouts last year but I am hopeful that my plants will be full of sprouts this year. Growing Brussels Sprouts – Easy and Hardy but They Don’t Like the Heat. I spent most of today hand tilling my garden bed. It was tilled with a rototiller last fall, but winter weeds have taken over the area where I had my garden. Oddly enough, the front part which was tilled into lawn to enlarge the vegetable garden is relatively full of weeks. I planted broccoli, brussels sprouts and head lettuce today. They were seedlings since I did not get my seeds until last week. Those will have to wait until fall to be planted again. 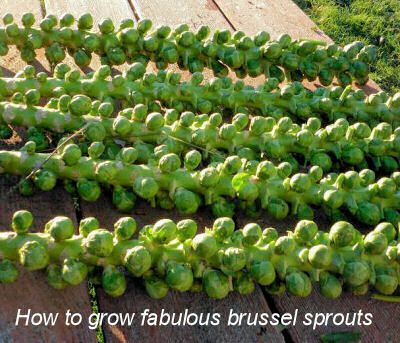 Brussels sprouts are easy to grow as long as you pay attention to the fact that they really do not like heat. If you get them in too late in the spring and your summers are hot, they will bolt and the sprouts will end up bitter. Soil: They will tolerate most soil conditions, but prefer a sweet or slightly alkaline soil. The soil PH should be at least 6.5 for best results. Adding a lot of organic matter to the soil will help them to maintain the moisture they need for best growth. Sunlight: Like most vegetables, brussels sprouts like full sun. 6 – 8 hours a day or more is preferable. In the hottest climates, they will appreciate partial shade in the afternoon. Watering: They need even moisture. Dry soil will make the sprouts bitter. Timing: Timing is everything with brussels sprouts especially if you live in zones where the summers are very hot. They take about 85-90 days to mature, so it depends on your zone as to when to plant. The main factor it to remember that the sprouts will ripen in the temperatures are higher than 75 degrees Fahrenheit. They love 60 – to 70 degrees and will have best flavor if they are allowed to grow during several periods of frost. This is because the frost converts the starches in the plant to sugar and makes the sprouts sweeter. Spacing: 18″ – 24″ is best if you have a long growing season that is not too hot (northern climates) I planted mine about 14″ apart since I doubt this spring batch will give me many sprouts. In the fall, I will space them wider, since I can over winter them in NC. Harvesting: The sprouts form at the axil or leaf joint. (you can see how the grow in the first photo above.) They look like tiny cabbages. They mature from the bottom upwards, so you should start harvesting when the lower sprouts start to get to the size of large marbles. Also trim the bottom leaves as the plant grows. Be sure to leave several leaves at the top though. Doing this will tell the plant to put its energy into making sprouts rather than making big leaves. The leaves are edible and lovely sauteed with garlic and spices. 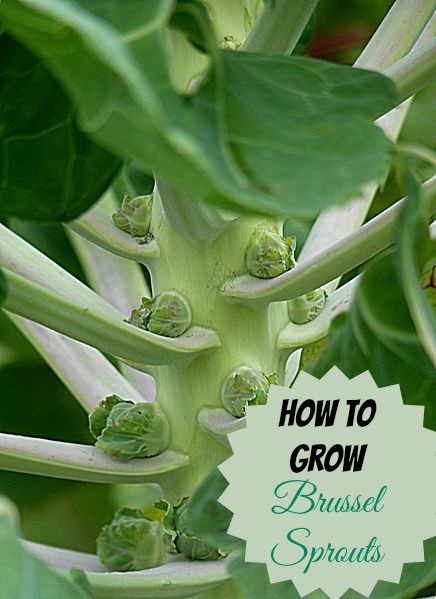 At the end of the season, or before it gets too hot, you can cut the top leaves off, and it will speed up the development of the remaining sprouts. Storage: Brussels sprouts will keep 2-3 days in the refrigerator. After this they will begin losing flavor. For long term storage, blanch for a few minutes in boiling water and plunge into ice water. Freeze on cookie sheets and then transfer to freezer bags. 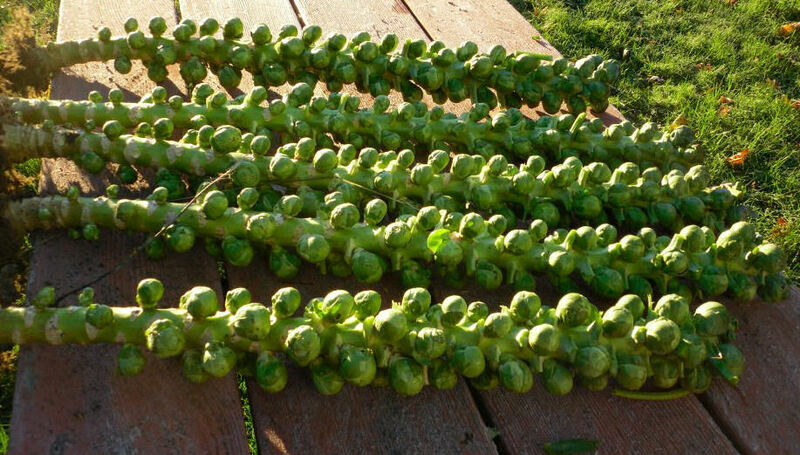 This photo is a picture of brussels sprouts which were harvested by my sister Judy, in Maine, in October. I drooled when I saw them. I can never get mine to this stage. I do have hope for some that overwintered for me this year. I planted them in late summer as seedlings. They produced mainly leaves but I am going to start trimming them from the bottom to see if I can get them to sprout early this spring. If they do they should be wonderful, since they went through the whole winter and several frosts. What has your experience been like for Brussels Sprouts? Did they grow well for you? Where do you live? Please leave your comments below. I want to try to grow brussel sprouts this fall starting October im in florida and that seems to be the coolest time of the year. What do you think??? This article gives a bit more info on times. You’ll probably need to plant soon. We grow brussel sprouts every year. We live north of Spokane Washington and we get temps in the 80-90s for most of the summer. It is now mid September and quite cold at night. We plant as soon as it warms enough. This year was June. Our sprouts are always wonderful flavored. We get a large amount of each plant. We have never trimmed off leaves. We never knew we should. We fertilize our garden in the late fall with horse manure from last winter. We produce enough veggies that we no longer need to buy any from the store. We use no pesticides. Hi Tony….thanks for sharing. My sister lives in Maine and has similar results with hers. I have no luck at all. I’ve tried both spring and fall printing. I thought i might get some this spring because they started forming but as soon as the warm weather hit, they all shriveled up. I did not realize about removing the leaves either until recently. next year I am going to try only in the fall and see what happens. i live in indonesia. I tried to grow brusselsprout but fail. I don’t know why… ? I planted brussel sprouts this year in april. Beautiful plants but here it is Sept. 14 and no sprouts. We have hot summers. I just cut bottom leaves off last week thinking that might help. I had a great crop of cauliflower that I planted at the same time. Live and learn. Try what you think will work, then try again if needed. Hi Jane. I have tried and tried to grow them with no luck. I thought planting in the fall would do the trick to, but alas not. Glad you have had good luck with them! I planted brussel sprouts this year for the first time. Although the sprouts aren’t very big, i am impressed they grew, i really didnt have much hope for them! I have 5 plants, almost 1.3m tall. We have really hot summers, i hope they didnt get any bitterness. Atm am waiting for december to harvest! I live in Europe, Romania. It does not matter so much where you live. Brussels sprouts are a cool weather crop. You plant them in the very early spring and again in the late summer for a fall crop. Hi. I am new to this vegetable gardening thing so forgive me. I live in south Texas, when should I start planting? Hi Patty. Brussels sprouts are a cool weather crop so they won’t do well in Texas in the summer. they need to be grown as a fall crop. This page may give you some information specific to Texas. I’m getting ready to start some from seeds inside and see if I can get them to grow in my sunroom which stays around 70 all winter. Here in Iowa, I know people have been successful growing them but I want to be able to rotate and have them ready to harvest every couple of months. This has been an unusually warm winter so far so hopefully, I can get a number of plants to sprout and can transplant several outside in the early spring. Wish me luck! As long as they get plenty of light, you should do fine. My mother had a sunny room in her Maine home and started a lot of garden veggies from seed. Hi Carol! I just read some of the info on Brussel sprouts. I live in Tennessee. Is that comparable to N. Carolina’s weather. Should I not even bother trying to plant these? Maybe in my basement?